Post Type: Select Post Types you’d like to use for the slider. 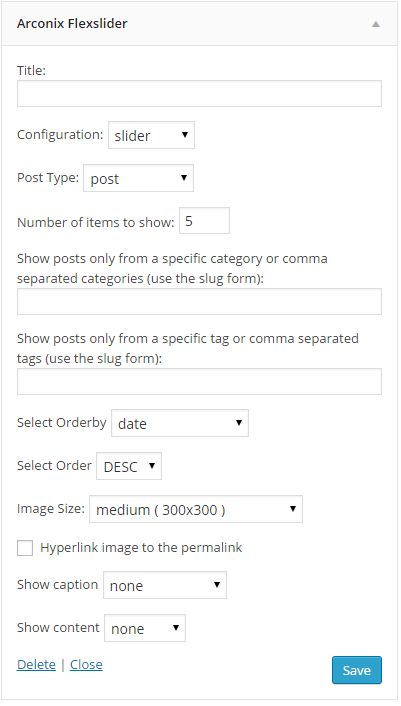 This list will include any Custom Post Types that may have been added. Hyperlink: Check the box to enable the item hyperlink on the image. Show Caption: Select the image caption you’d like to use for the item, or none for no caption. Show Content: Select whether you’d like to display the item’s excerpt, all the item’s content, or none for no additional content.